This modern cabin (short term rental license MCA #681) is both cozy and light-filled, with designer touches throughout. Step out the front patio door to the two huge decks overlooking the renound seven mile Manzanita beach. You'll find our greatroom not only cozy, but it also features huge 180º views from Neahkahnie mountain all the way south to Rockaway beach. Our brand new view kitchen awaits those who love to oook with european fixtures, stainless steel appliances including a super quiet Bosch dishwasher, Pratt & Larson tile and custom cabinetry from local craftsmen. Dine with up to 10 guests next to the view windows and the big vintage beach rock fireplace. Or kick back in the living room area furnished with just the right touches in order for you to sit back and enjoy the beach view, a roaring fire in the charming fireplace, or watch your favorite show on the HD TV. You'll love the master bedroom with cozy queen pillowtop mattress, private bathroom with Pratt & Larson tile and european fixtures, and you own private access to one of two big decks overlooking the beach. Or cuddle up in the second bedroom with european queen bed and a peek of the ocean view. All beds come equipped with luxurious high thread count 100% cotton linens and designer bedding. Not only does the second bathroom feature Pratt & Larson designer tile and european fixtures, you'll love the heavenly radient floor heating. Guests will enjoy the privacy of a second gathering area in the family room with comfy designer touches and HD TV, large storage closets for all your gear, new front loading washer and dryer, and coveed parking and enterance. Three sets of bunk beds finish our third bedroom, all with comfortable twin mattress. And our third bathroom features charming handcrafted tile, european fixtures, and a bathtub shower combo. You'll note this is a two story house featuring a custom spiral staircase. This modern cabin is not only front and center for the fabulous Manzanita July 4th firewords display, it less than 75' across a quiet community road to the wonderful Manzanita beach, and only three blocks to the main street of Manznaita. Park your car and sit back and relax or walk to everything you'll need for your next wonderful coast vacation. Pursuant to the local Short Term Rental Codes, please note the following: Manzanita Certificate of Authority No. 681. I'm Kim Bergstrom. My husband, Eric Bergstrom, have built on my father's dream of owning a beachfront house on the Oregon Coast. We now own three, and much to my husband's dismay we continue to grow. We purchased our family beach house from my father in 1996, and have thrived through sweat equity - most people think of us as rather crazy, but we've taken something we love to do and are making it our second chapter in life. We enjoy taking properties with potential and great location, adding a facelift without removing the character, and introducing them to our expanding group of guests. Our latest endeavor is a turn of the century three story house which will sleep 20. We put a lot of thought and work into each house, and luckily have found guests who love the results. Like many of our guests we've come to know over the years, we hope you also come to think of this special house as your very own vacation home - without all the work! With deep ties to the Manzanita community, we've watched this house over the years. Put up for sale, it needed love and attention, from the weedy front yard to the small windows and precarious route to the side deck. Kim and her daughter saw the potential and convinced Eric to join in the fun. There definitely was a learning curve for all - by the end of the project we could have written a book detailing the fun and craziness with remodeling a cedar log house. With big windows and decks to take advantage of the beautiful setting and gorgeous ocean views, opening up smaller rooms to big open areas, designer touches here and there -- well, we invite you to see the results. Or check out our reviews. Our regular guests, and new guests, have awarded us great feedback. And every happy guest makes the experience worthwhile! We've finished our remodel and are now open for guests. 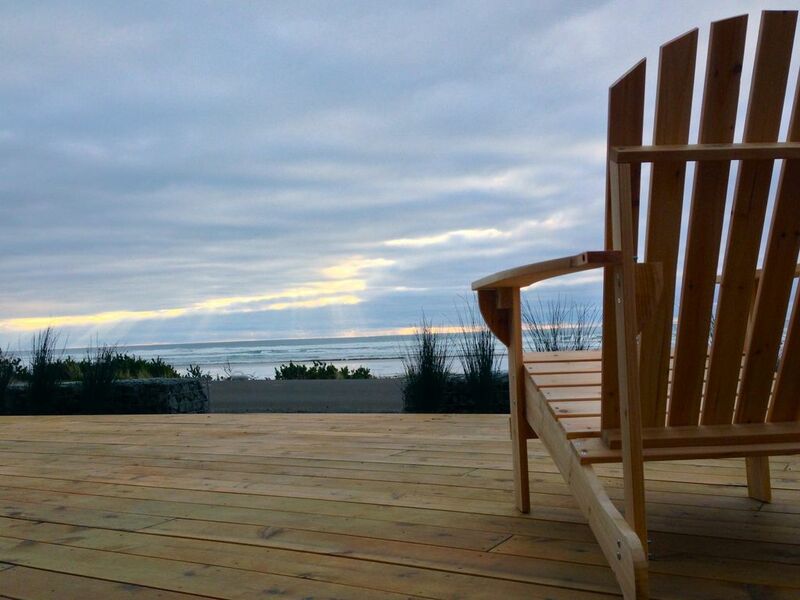 Spend your next vacaton at this newly remodeled oceanside house on one of the most famous Oregon beaches. Add front row seating to the July 4th fireworks and it's the best location on the beach! Loved it. Perfect for a large family. Beach view was amazing. House was very clean and well stocked for large family (6 people). Beach access and sunset views were amazing. We’ll be staying here again in the future. Great house. Perfect location. Very clean & comfortable. Great house. Had everything we needed and more. Very comfortable and clean. The location and view is outstanding. Highly recommend this modern beach house. This is a great place with an ocean front view for our family to get out of town for a few days. The main bedroom with the bathroom inside feels so comfortable and cozy. If you're planning on staying here during the winter time and wanted to have a fireplace going, beware of the smoke, despite the open flew, it seems like the chimney is too short to bring the smoke upward. So, between the smokey fireplace, wet weather and a cheap Ikea couch - it's still a great beach to be! Hi Tina. I'm glad you liked the comfortable and cozy house. We're always available 24 hours a day to deal with any issues guests might have at the house. Unfortunately there are days at the beach when, due to the weather, neither the flue nor chimney cap (updated with the remodel) can compete, but we can help with the issue. Neither the West Elm sectional nor the Crate and Barrel sofa are usually not thought of as cheap couches, however we're disappointed they were not to your liking. Please feel free to contact us directly with your suggestions. We try our best to exceed expectations and offer relaxing vacations. Please contact us about questions regarding the property. We are in the midst of changing our systems and are undergoing quality control review.